The back of the box has nice, clear photographs of the other dolls in Series 2: Animula (love her hat), Irae (she has my favorite name) and Mentis (a boy?). Erro has the least interesting outfit of the four, but she was the only one I could find new in box at a decent price. 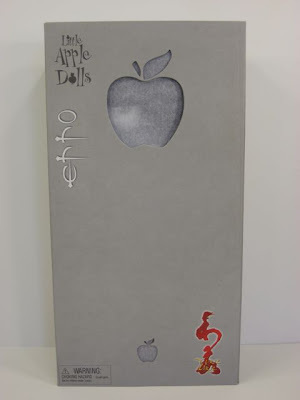 The front of the box has a flap that is secured with velcro (like the earlier Liv doll boxes). 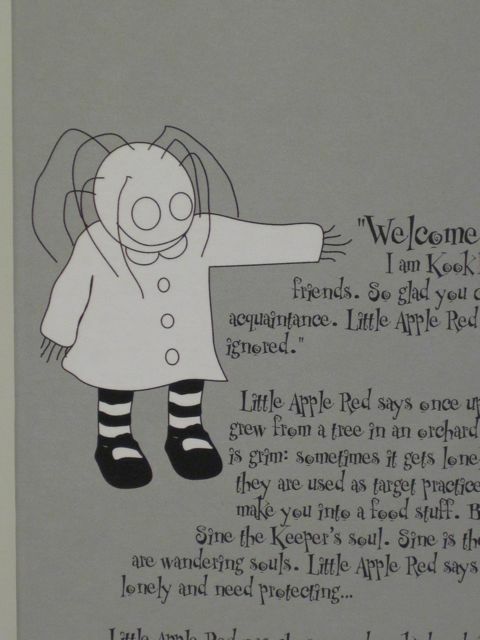 Kook is friends with a bird, Charles, and also with the apple, which is apparently not a snack, but rather a character named Little Apple Red. 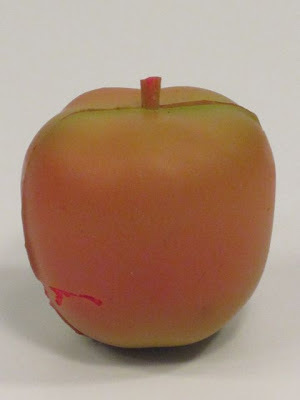 It turns out that Little Apple Red used to be a regular apple, but then he (it?) got chosen by Sine (who is the Keeper of the Inbetween Place) to be the protector of children who are lost in the Inbetween Place, whatever that is. 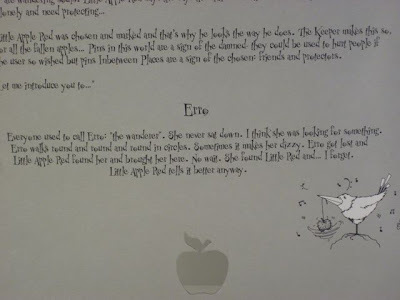 So...it follows logically that Erro must be one of the kids lost in the Inbetween Place, under the noble protection of an apple. 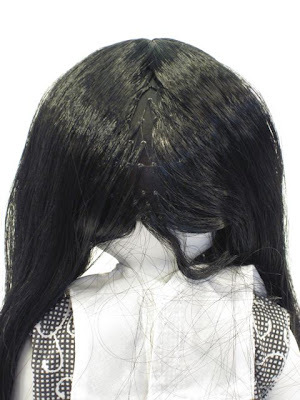 Her hair is held in place with two of those awful stitched plastic strips. It was also apparently taped to the cardboard at some point. The tape on my doll is yellowed and crumpled with age and was making a sticky mess. 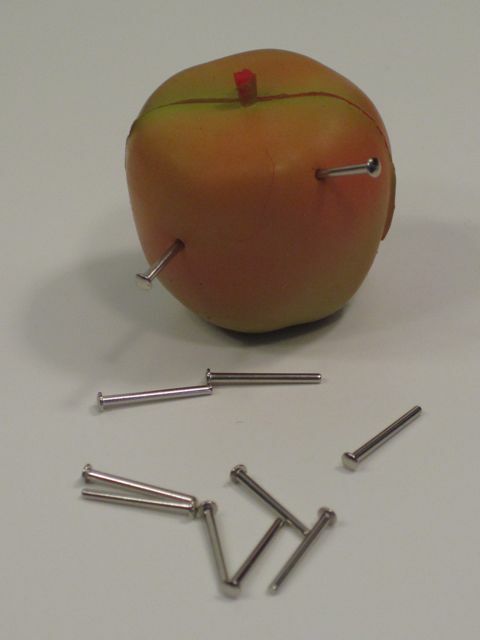 Because every apple should come with pins. The story is a mysterious, disturbing tale of how Erro is stuck wandering in what is presumably the Inbetween Place, trapped by a malevolent female presence. 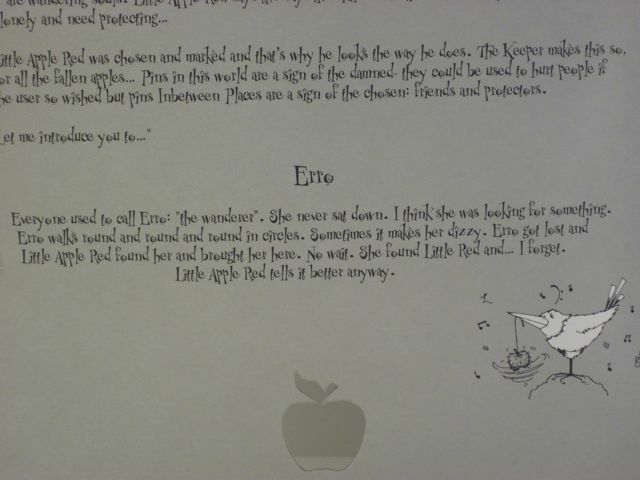 I am guessing that Erro was rescued from this nightmare-like scenario by Little Apple Red, and she is sharing her experience as a kind of memoir. That's what I hope, anyway. I enjoy dark stories and mild, cult horror (Steven King's The Shining or Buffy the Vampire Slayer--that kind of thing) but I have to admit that one element of these dolls that doesn't sit well with me is that they are meant to portray little children who are stuck in between the living world and the dead (hence the "Inbetween"). 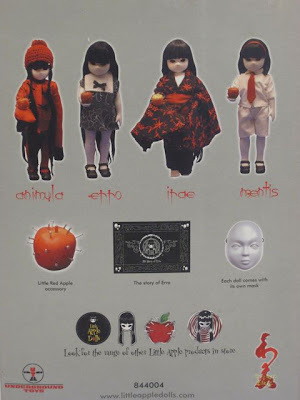 The Little Apple Dolls are a much, much milder interpretation of dead children than, say, the Living Dead dolls, but I am finding that as I get older, I have a shrinking tolerance for themes like this. If I felt differently, I might be very tempted to check out Yurei's book, Welcome to the Inbetween, to learn more about this dark fantasy/horror world. Yurei's ideas are definitely fascinating and creative and almost seem like an interpretation (or memory?) 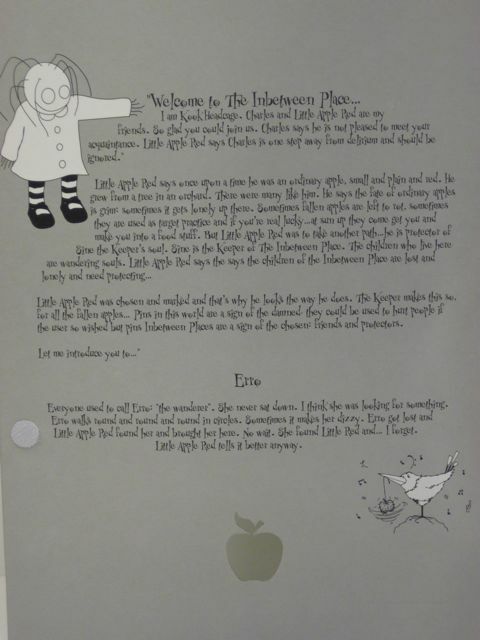 of how a young child would deal with the scary unknown that surrounds death. You could knit a sweater with that. The hair has a life of its own. 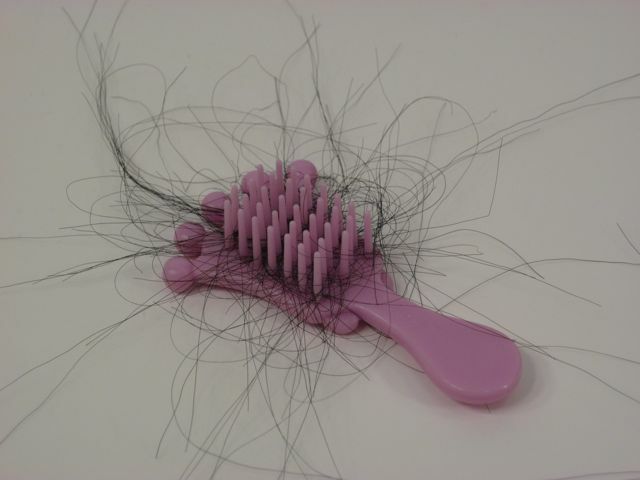 It is constantly trying to fly away or tangle. That took, literally, two minutes to happen. I may be spoiled, but in my opinion this hair is awful. 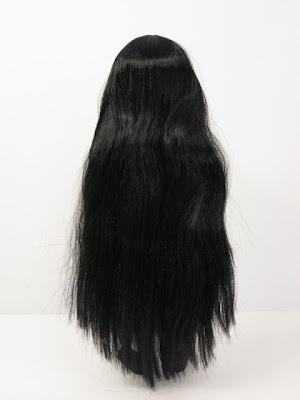 I find it especially frustrating when a doll with bad hair has excessively long hair. That just magnifies the problem. 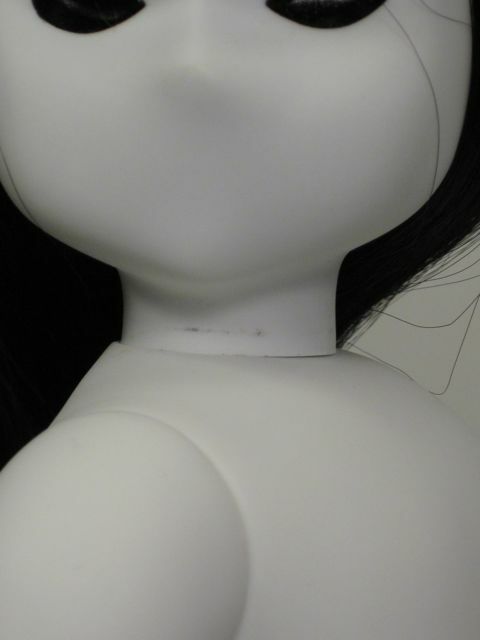 I also think that since this doll has very few details or features besides her hair, her hair should have gotten more attention. 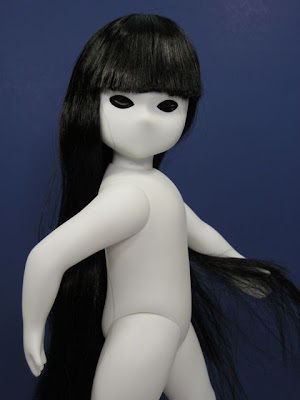 I am hoping and guessing that the newer dolls that were made under Yurei's watchful eye have better hair. Little Apple Red is meant to be filled with small needles. These are blunt (which is good) and therefore hard to get into the apple (which is bad). 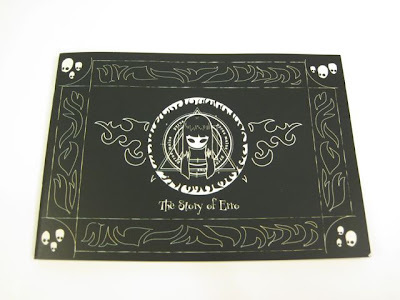 I thought at first that this was some kind of voodoo pincushion, but the story on the flap of Erro's box explains that pins, while destructive in the real world, are actually symbols of protection and friendship in the Inbetween. Who knew. Further evidence of Yurei's off-beat imagination. You'll be sorry, Mr. Apple. Oh yes, you'll be sorry. 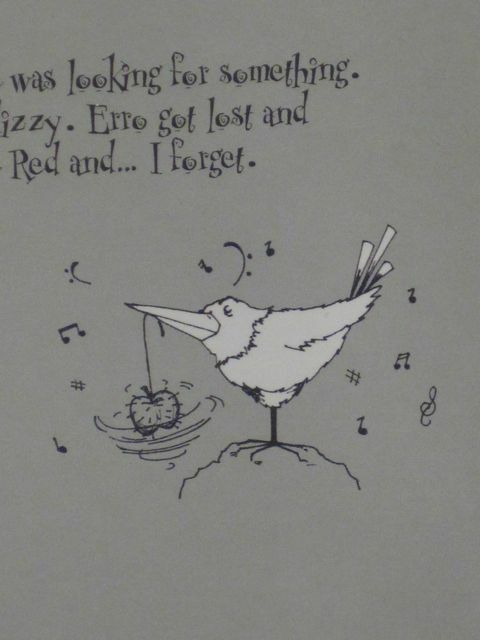 But wait a minute--try looking at another picture of Erro and this time, try to see the wandering, lost little girl searching for a magical apple's protection. It's there, isn't it? There's an innocent sadness in that strange face. It's neat how an absence of features can make a face open to very different interpretations. Help me, Mr. Apple, you're my only hope! 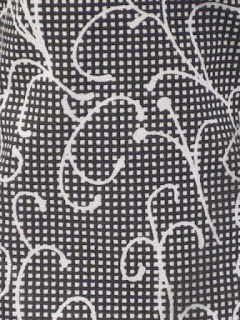 My dress has dirty smudges in some places. Hmm. 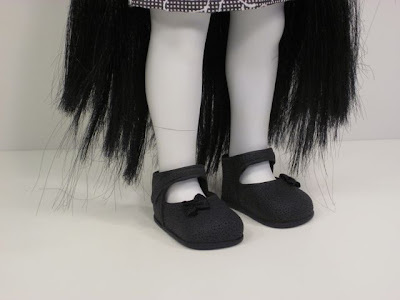 Erro has cream colored knee-high socks and black textured plastic shoes. I am not sure why the socks are cream and not white. 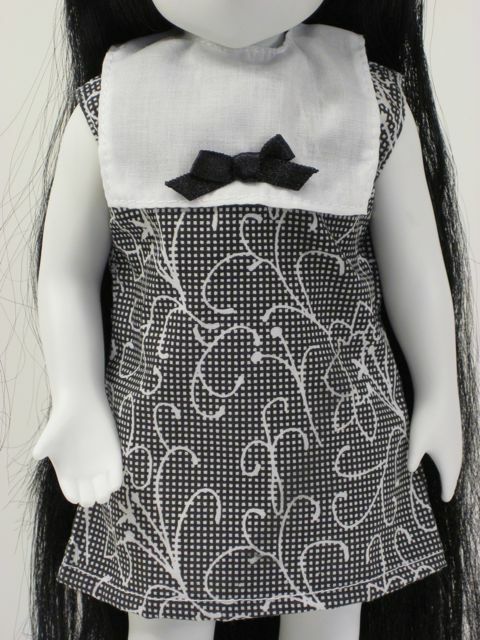 Nothing else on this doll is anything but black or white. Maybe it's to contrast with her white legs? The shoes are extremely difficult to get off. I had to brace the doll and pry the shoes off with my thumbs. Then I had to re-brush her hair for ten minutes. 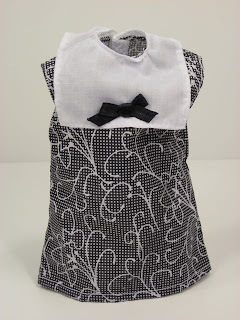 The shoes look cute, though, and the bow detail is a real fabric bow, not plastic. The handprints are clever--it looks like she was just covering her soul-sucking red eyes with her hands...except that the hands are backwards. Someone else was covering her eyes. Sinister. Bottom line? 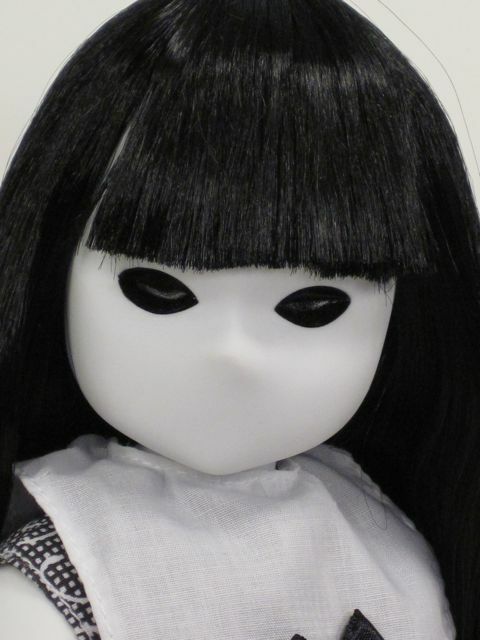 This is a fascinating and creatively creepy doll with some very disappointing shortcuts in quality. There is clearly a rich imagination behind this doll line. Each doll has her own individual nightmare-like back story told in a beautiful little book. 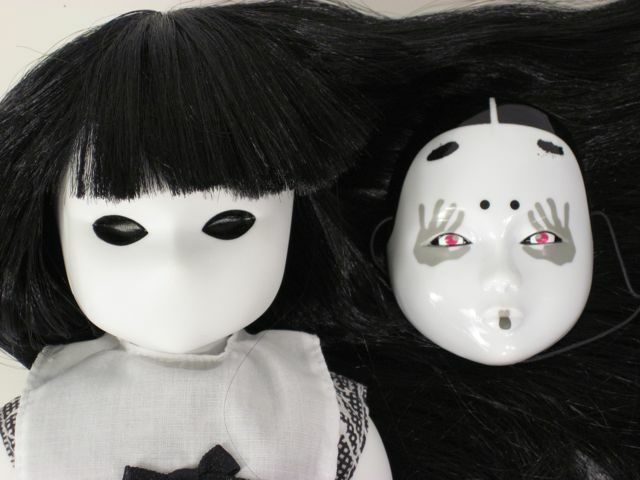 The group of dolls is united as a whole by the disturbing idea of the Inbetween and the strange characters that exist within. Erro's story reads like a fable, yet rather than a moral at the end, there's an uneasy sadness and a some confusion. Despite being turned off by the concept of dead children wandering around lost and alone in the Inbetween, I do find myself transported into this dark realm and curious about the other components of Yurei's vision. 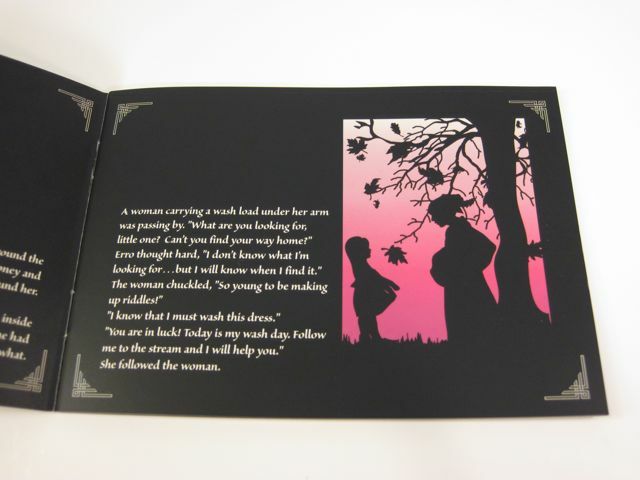 What are the other dolls' stories? Do they tie together in some way? I can see the appeal in having several of these odd creatures sitting on the shelf...if only so they aren't alone anymore. The design of the Little Apple Dolls is interesting to look at and undeniably unique. There's a balance of human and otherworldly features. 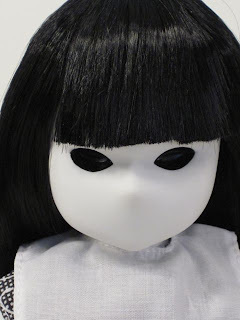 The vacant, black hole eyes and lack of facial definition make it clear that there's something sinister about the doll, but the plain features, in particular the absent mouth, also mean that the doll's demeanor can be interpreted in contrasting ways. 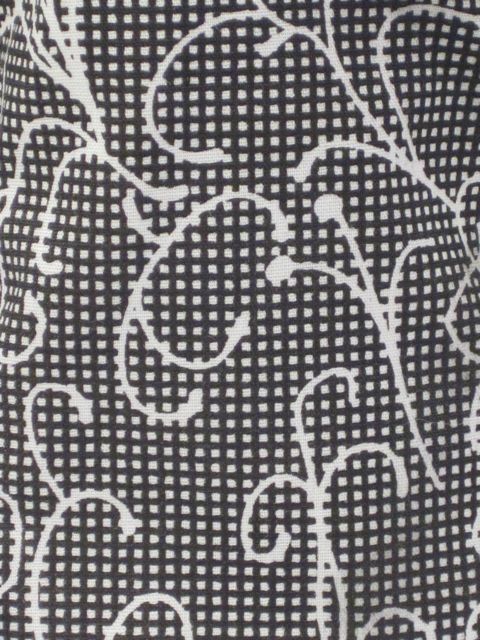 The simple, childish dress softens the alien features. Erro's mask adds another dimension to her already intriguing character. 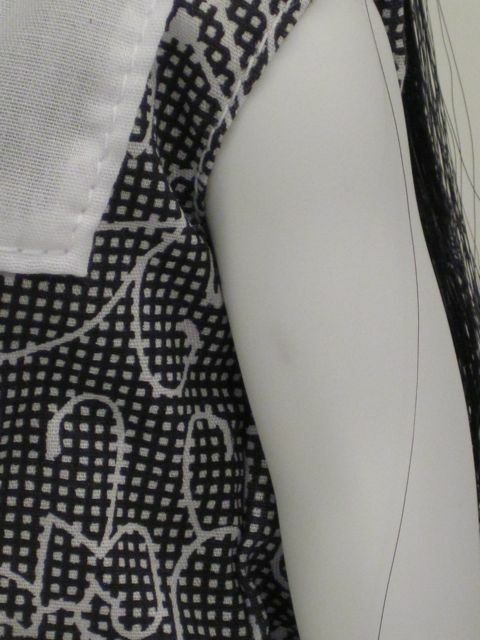 The quality of the doll does not match the design, though. The dress is simple and cheaply made and the hair is a horrendous mess. The shoes do not come off easily, and the socks are a careless departure from the black and white theme. The mix of a great concept but substandard execution make me happy to learn about the current state of affairs for this doll line. 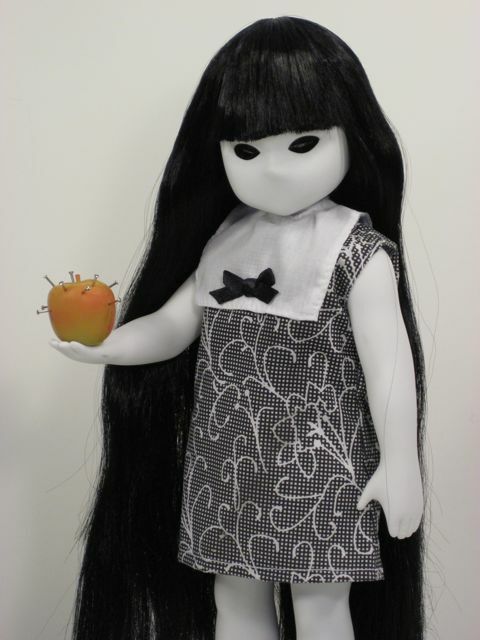 If Yurei continues to produce these dolls in small, well-made (?) artist editions, I think they could become an enduring contribution to the diversity of modern dolls. 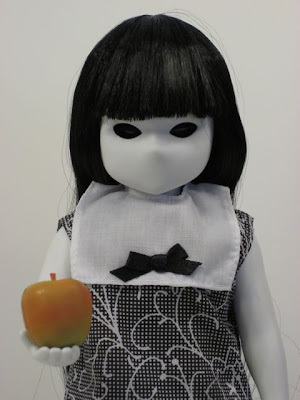 I would definitely consider buying one of the newer versions of this doll, but with no new activity on the website for about six months, I worry that we might have seen the last of the Little Apple Dolls. Update: you can see pictures of one of the mini Little Apple dolls over on facebook. Fair at $25. Some of the secondary market prices are too high. 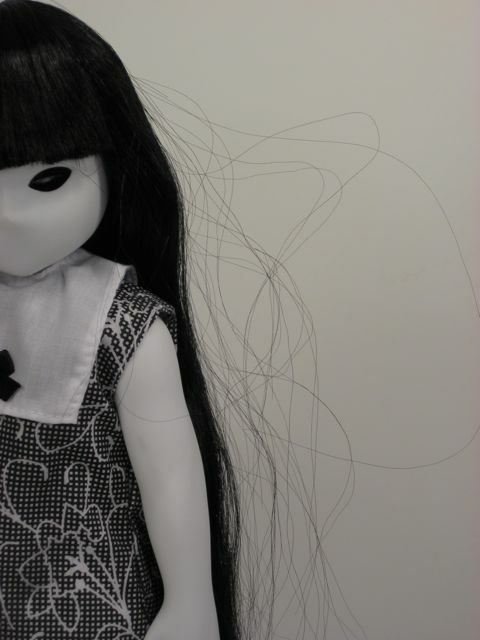 The simple clothing and unmanageable hair on this doll are its weaknesses. These features detract from what is a very artistic design and concept. Stylish and well-conceived. Could easily be the box of a much more expensive collectible doll. Yes, because of rarity and a unique niche. Not at all versatile. This doll is a very stylized character intended for display. 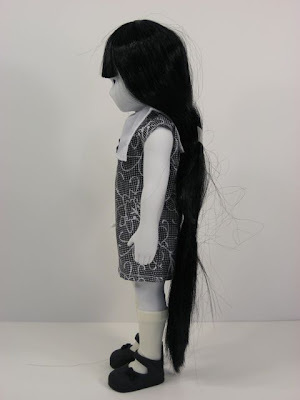 If it weren't for the hair, I could unreservedly recommend this doll, particularly to those who appreciate Monster High, Living Dead, Emily the Strange and other off-beat, dark themed dolls. That doll is just creepy!!!! 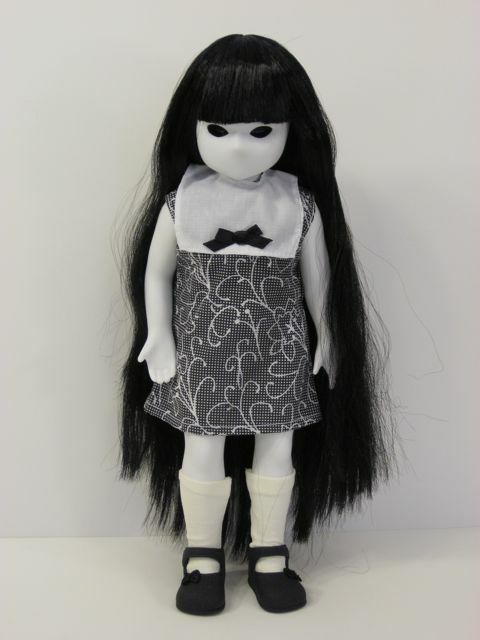 I love different dolls, she is so creepy and cute at the same time. 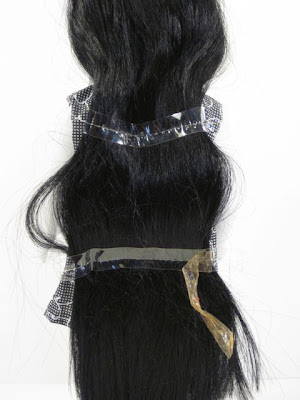 It's too bad the hair is so bad, if a person was at all good at rerooting doll hair it probably wouldn't be much of an issue. I love different dolls too, Molly. It's fun that there is such a variety to choose from these days! I am going to try harder for a nice braid or maybe two braids using Elizabeth's tip, below. The hair really needs to be put up or maybe cut (gulp!). Thank you again for introducing me to these dolls--I had a wonderful time yesterday learning all about the Inbetween. I am always impressed when there is so much thought and creativity behind a doll line. It is inspiring. Hi Elizabeth! I love how your Frankie looks with her new wig. I like her tall kitty friend, too. :) Thank you for the shout-out on Flickr! You know, you keep me very busy because you're always giving me awesome new things to investigate. 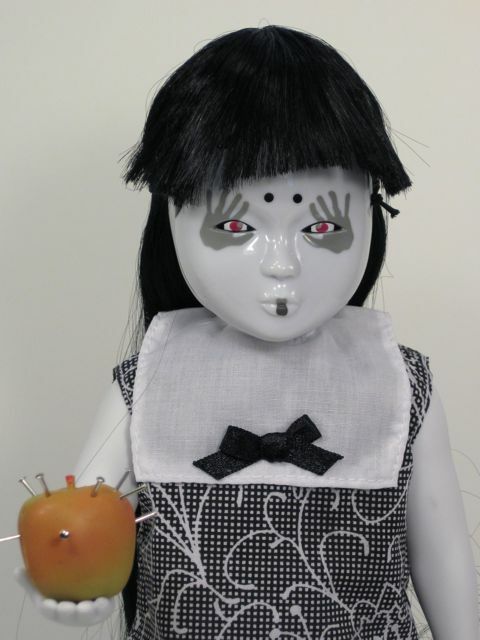 I have spent the last hour searching the Bleeding Edge dolls online--they are great! It almost seems like they could have been the inspiration for Monster High dolls. I have seen Living Dead dolls, but they edge a bit too close to the gross end of the creepy doll spectrum for my taste. That being said, there are a few that aren't as creepy who I'd love to have, like Frozen Charlotte. But I think everyone wants her so she's very expensive. You make the pigtail trick look easy--it's definitely worth a try, although keeping the tangles out of the hair for the five minute it'll take me to do the braiding might be a challenge. ;) I'll let you know if it works, though! As always, thank you for your input and tips! I love your Flickr album, too. Hi Emily! I've been reading your reviews for about a month now but this is the first time I've commented. 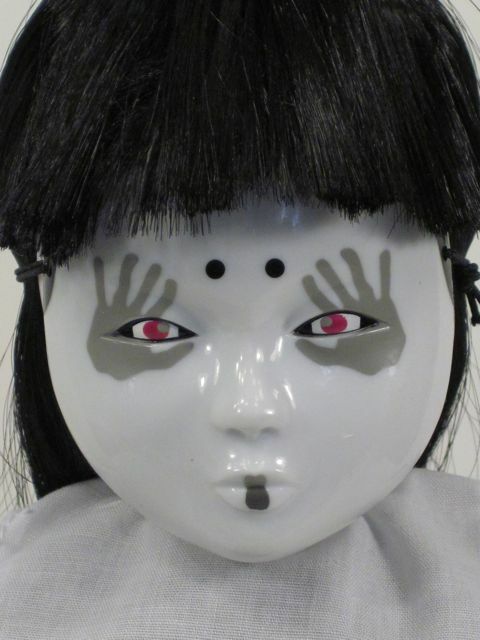 What an intriguing doll! I too like dolls with a backstory or mythology, and though the InBetween story sounds quite dark it's also kind of cool. 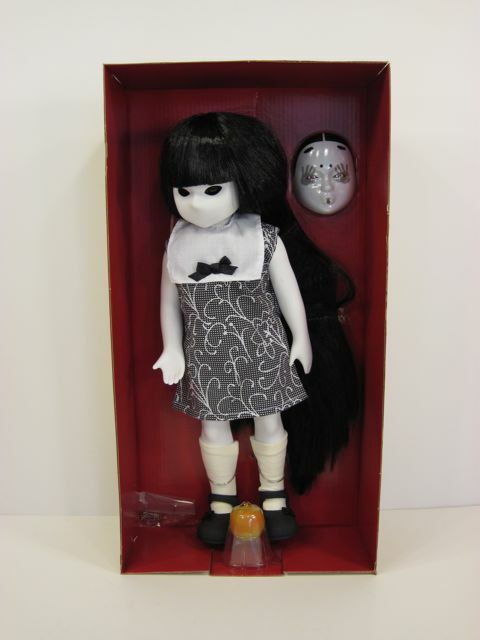 I like the minimalist style of the doll and packaging. I may have to look these up on eBay! Just out of curiosity have you heard of Tangkou? She's a Chinese fashion doll with a body and head similar to Pullip, with a changing eye feature almost exactly like Blythe. She seems like a doll you might like. Keep up the great work! 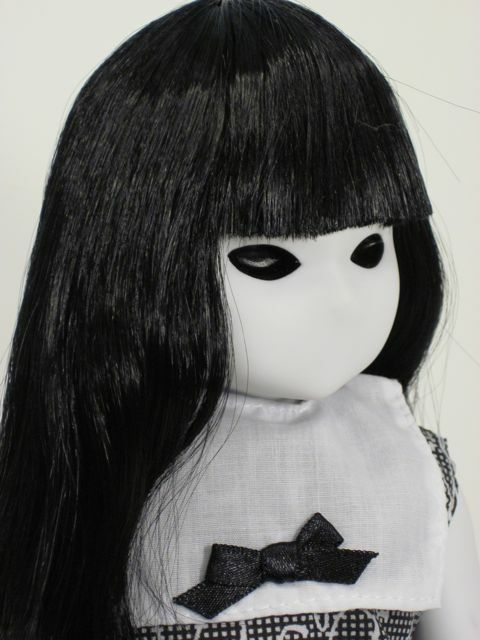 I love your in-depth reviews and honest critiques of both mainstream and lesser known dolls! Thank you so much, John! Despite Erro's creepy appearance, I find that dolls with a story tend to stick around longer in my collection. I actually caved and bought the book because I want to know more about the Inbetween. These dolls are a bit tricky to find--some of the prices are way too high ($50 is too much IMO). There's an Animula on eBay now with a great starting price. You can also get mini dolls new in box for about $13 if you just want to see what they're like. I have seen a few Tangkou dolls--one of my favorite doll photographers on Flickr bought one a while back and took some very nice pictures of her. 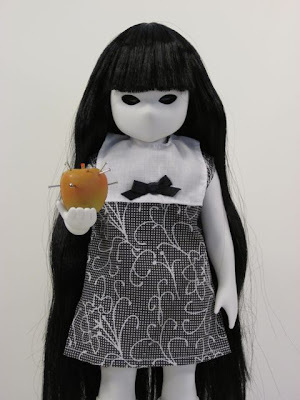 The price on these dolls is very good--making me wonder how they measure up to Pullip in quality. Your comment prompted me to read up on Tangkou and I found two pieces of great news--one, the selection of dolls is much better than it used to be and two--it's become very easy to buy them online at the Tangkou shop! Oh--and there's a wigged version now with blue hair. Wow, how cool (and surprising!) there are mini versions of the Little Apple Dolls! That probably would be a better bet as an introduction to the dolls. 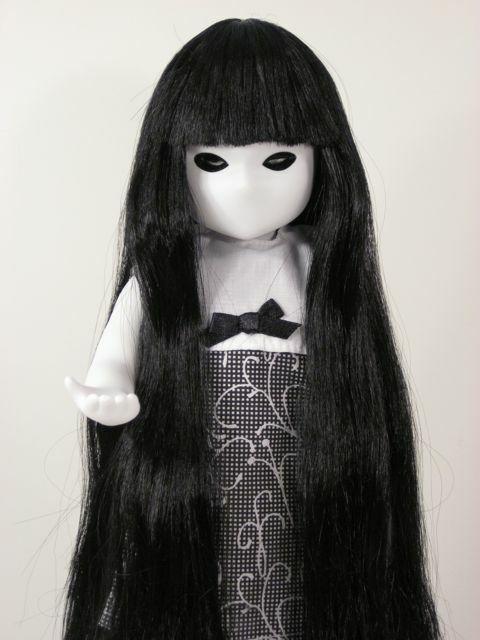 Plus I love mini dolls like Petite Blythe and Little Pullip anyway. When I first discovered Tangkou nobody was even sure if they were still being produced. So glad they are! I definitely hope to see her make an appearance here. Your no-stone-left-uncovered approach would make for a great read! John, I put some pictures of one of the mini dolls over on facebook. 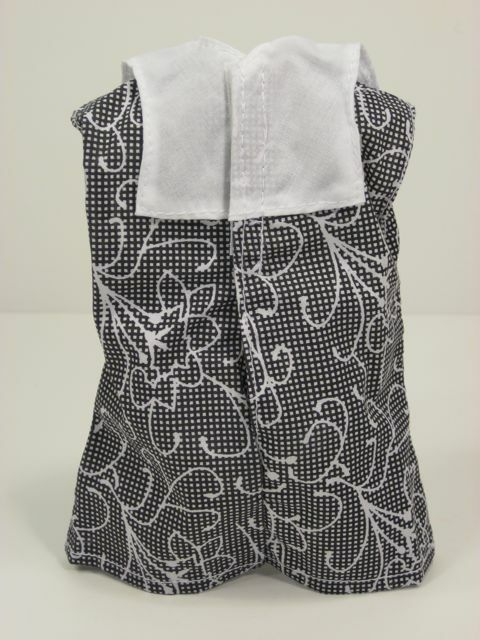 The minis are nicely done with removable cloth clothing. They're TINY at just over 4 inches tall and have plastic hair. I am so glad you aren't having hair hassles with your Irae and Animula! That gives me hope that maybe there were good batches and bad ones. I saw a You Tube video of an Erro and her hair looked fine. Huh. I like Animula a lot, although it's too bad the hat isn't like the promo pictures! That's a great looking hat. I think I agree about the mask, too. It looks better over the bangs because of the painted hair on the mask. Good call. She's so cute. The poor dear. How fascinating. 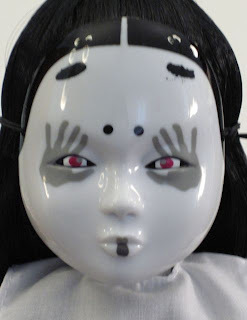 It's clear the doll is derived from Japanese religious sources. I studied Japanese culture and film many years ago and there were harrowing stories of those who died tragically being caught between realms. Japanese cinema is unparalleled in understanding the real nuances of horror. You have only to see "The Ring" or "The Grudge," great works of imagination to see that. Perhaps it is because as a people they suffered from actual nuclear bombing, but the sources are even older. I will have to dust off some of my old books on the subject. It would be great if a Japanese scholar could sound in on this. I thought Sekiguchi Printemps dolls were unnerving. But this takes it to a whole other level, a "Blair Witch Project" level if not worse. I bought some inexpensive older porcelain dolls on ebay that had a less jarring, but nonetheless distinctly gothic feel to them. Turns out they were sold under a French name but had a Japanese distributor. A pallor in the complexion, a vacant, dark, stare although not entirely black. 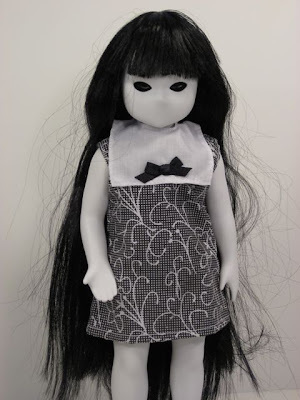 I see the appeal of dolls that remind you of their unreality (why I don't know) but I prefer a lighter tone: nothing more terrible than Marie Osmond's "Start Me Up Belle," for example, Dare Wright's lonely doll, or some Celluloid dolls, and I'm always on the lookout for those, but they aren't common. Maybe it's because they very easily can conjure up the doppelganger for a lot of people. The more I think about it the more natural disasters like earthquake, tsunami and even military occupation, must also have played a part in shaping the cultural psyche which would make dolls like this not only possible, but likely. I agree that it is oddly fascinating to get a glimpse at another culture's vision of death--particularly the death of a child, which is especially difficult to process. And I like your hypothesis about how the collective experience of a country shapes that vision to a large degree. I find it interesting to contrast Little Apple's uneasy, unresolved take on death with our own culture's approach. I would have said that we are less willing to embrace the darker, uncertain elements of death--but that could be way off. Living Dead dolls leap to mind as a comparison because they originated in the US. 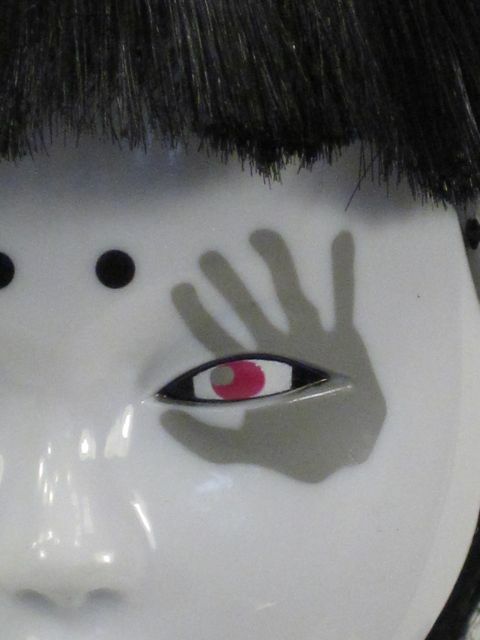 Those dolls are very violent and in-your-face rather than beng subtly unnerving. There's also a tongue-in-cheek playfulness (not quite the right word...) to the Living Dead line that I don't sense from Erro. 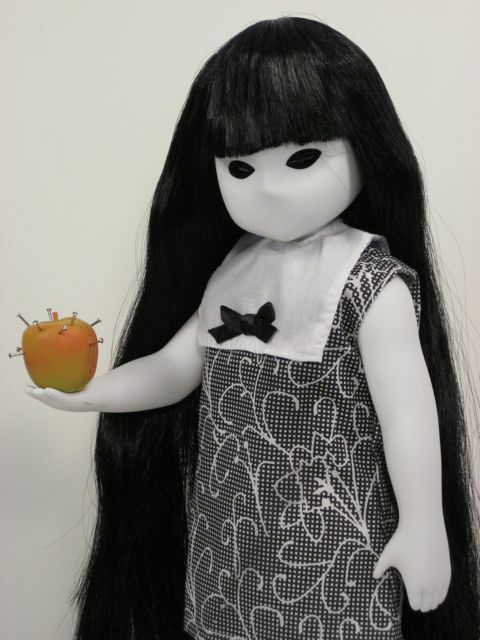 The Sekiguchi Printemps dolls are really eerie! In many ways, I find them more disturbing than Erro, maybe because they come closer to looking real? My goodness. 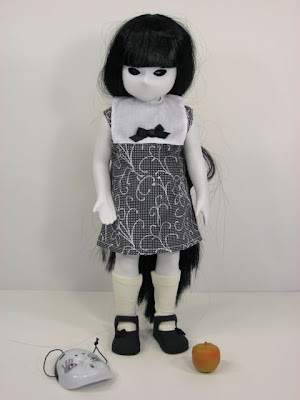 I had never heard of those dolls before, but they definitely add an interesting step in the creepiness spectrum. Yes--in part I'd say because Marie Osmond is such an interesting subject for cultural study herself. 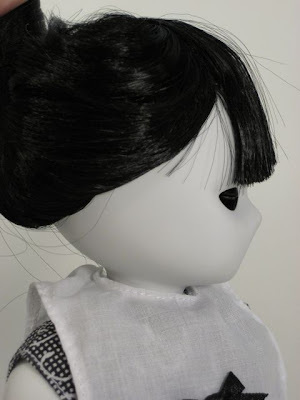 :) There is a Sankyo doll dating to 1977 (sometimes identified with "the Collection de Poupees Claudie et Claude")that mixes the sweetness of the typical Marie Osmond doll with a tinge of that Little Apple dark-eyed eeriness. 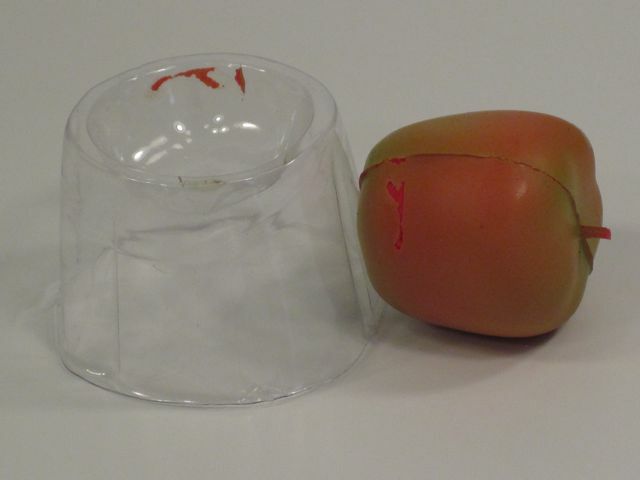 I saw two selling on ebay now. The companies listed are different but the manufacturer must be the same. 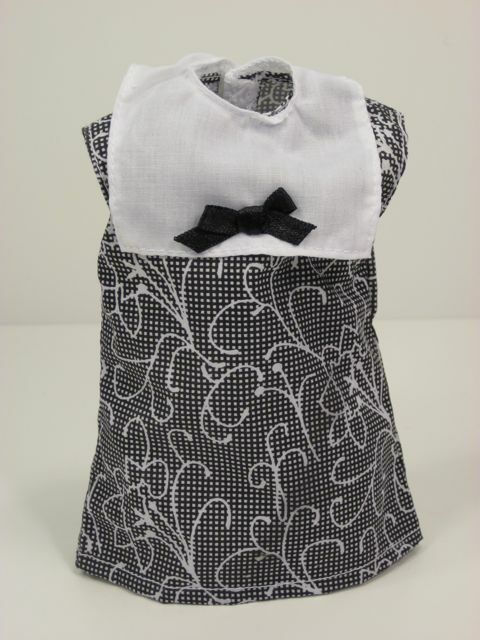 I'd love to send you pictures of those inexpensive porcelain dolls I mentioned earlier. They are striking. 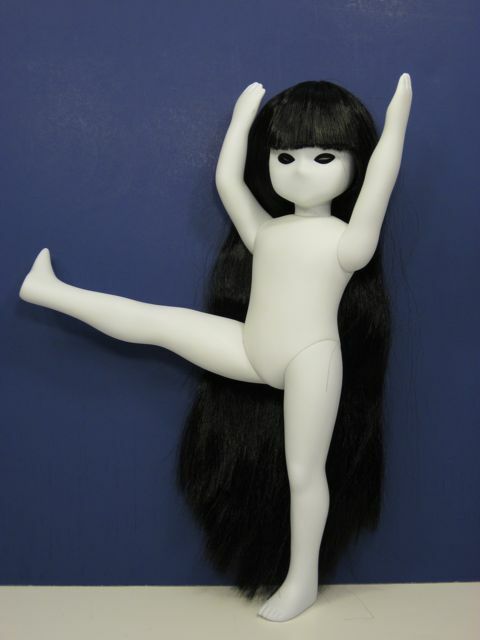 What I actually like about the Sekiguchi dolls is the grace of their body design. With normally expressive eyes they'd be wonderful. I just haven't found one available for a reasonable price that could be customized as they are eagerly sought after by collectors. I think it takes a fairly eccentric or melancholic person to be drawn to them. As far as our ability to embrace the darker uncertain elements of death--maybe Coraline is leading the way, and maybe dolls like those by Nancy Latham, but as a country we can't be accused of being so young and naive anymore, can we? We've known 9-11, a world economy shaken, and uncertainty is in the air. I ran across your page when I Googler these dolls. I received a mysterious package at my door with my address but no name. I look inside and I had received one of these creepy yet oddly amusing dolls. It left me with an erie feeling cause I collect Pigs not dolls. Inbetween reminds me of "Everlost" a book about 2 kids who die, but they get lost trying to go to Heaven, and stay in Everlost, where they are basically ghosts. I had no idea these dolls even existed until I read this review. And the moment I laid eyes on Erro, I knew I had to have them all. Now I'm weirdly obsessed with them, without having the slightest notion of why that might be. 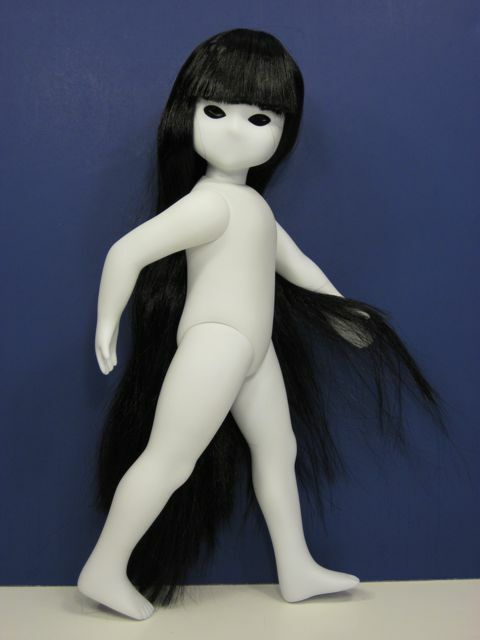 I like unusual dolls for sure, but LAD transcend unusual and then some. 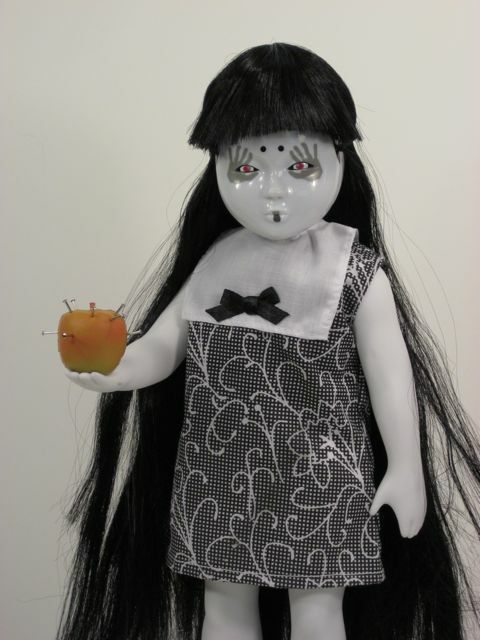 I am relatively new to doll collecting, and as such, it has descended on me like a fever or all-consuming addiction. I was very excited to find your reviews -- although, I collect dolls to accrue future value, so I find myself gasping and feeling faint as I flip through the pictures of the dolls being taken out of the box, stripped down, and sometimes disassembled. Anyway, I love, love your reviews and I thought I should let you know you're an enabler. I would never have become such a LAD nutcase if not for your fantastic review, so congratulations: I'm even weirder than I was before. Well done! I look forward to further reviews! 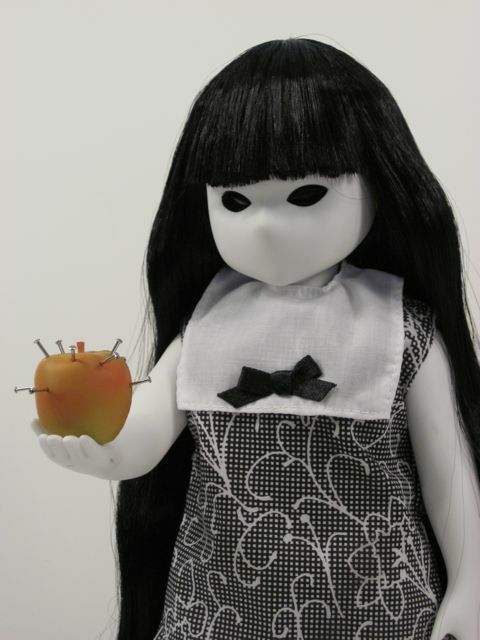 I know I'm very late commenting on your review, but I just now found it by Googling Little Apple Dolls. Thank you for doing your usual great job...wish I'd seen it sooner, but that is of course my fault. 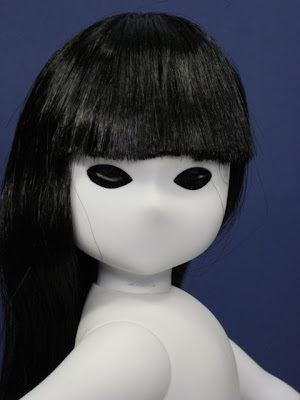 I recently discovered these dolls, fell instantly in love, and ordered one before I'd even thought to check on such details as quality of hair! 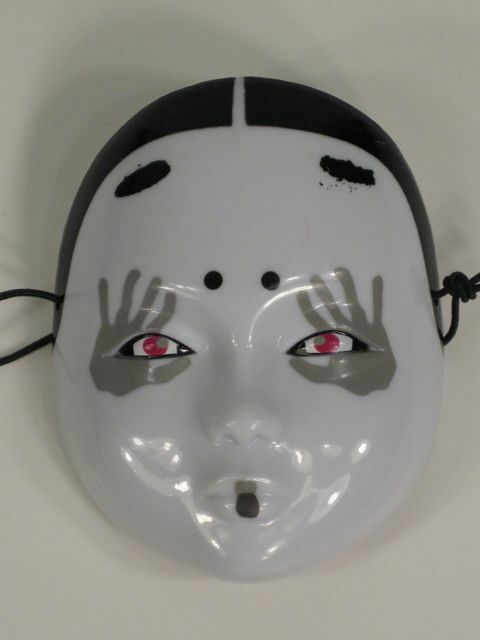 Eh...it's not surprising, given how relatively inexpensive the Underground dolls were/are. 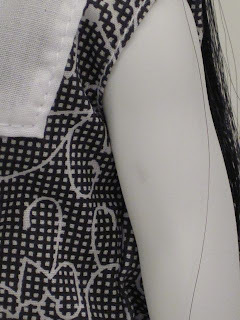 I've dealt with Disney doll hair (*cough*Little Pocahontas*cough*), so I can deal with this...but now, thanks to you, I know better what to expect when my Sine arrives, and I appreciate that a lot! I'm off now to catch up with your blog in the president and read more about more kinds of dolls. Thanks again for the time and effort you put into doing this! Love reading this. I found one in a thrift shop. I even managed to de-tangle her hair. LOL.But I love it. 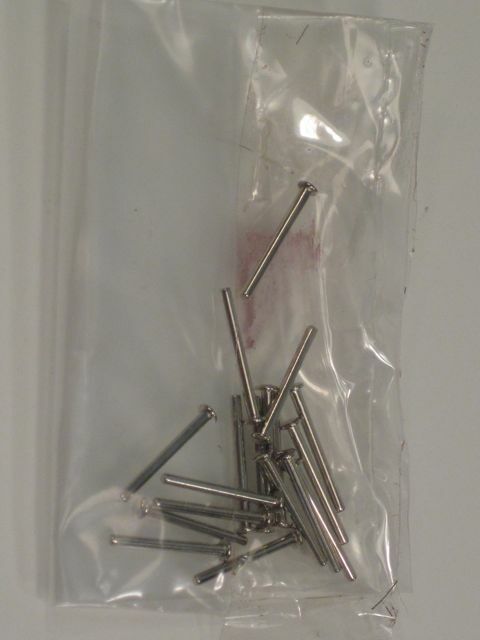 Anyone can help me where to buy in Tokyo?